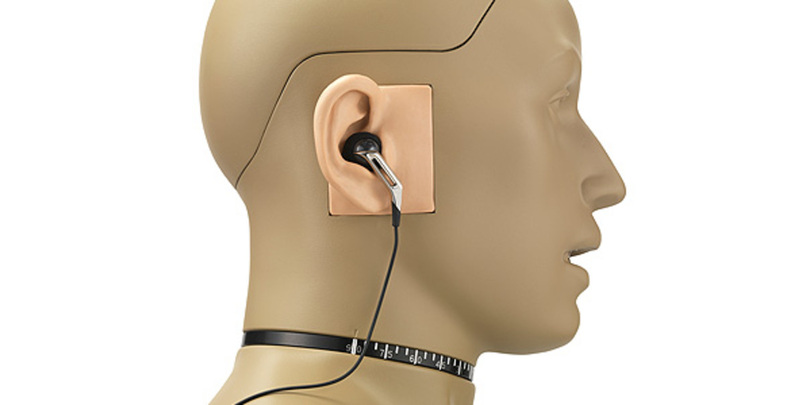 The 45BB-5 is a KEMAR head and torso for 2-channel ear and headphone test, with externally polarized ear simulators and large 55 Shore OO pinnae. The main configuration specific components of the 45BB-5 are the GRAS RA0045 Ear Simulator According to 60318-4 and the KB0066/KB50065 large pinnae. The acoustic input impedance of the RA0045 Ear Simulator closely resembles that of the human ear and, as a result, loads a sound source in very much the same way. It complies with IEC 60318-4 and is measured and calibrated according to ITU-T P.57. It embodies a number of carefully designed volumes connected via well-defined and precisely tuned resistive grooves. In an equivalent electrical circuit, capacitors would represent the volumes, and inductance and resistance would represent respectively air mass and air flow within the resistive groves. Read more about RA0045 here. The KB0065 and KB0066 are large straight pinnae for use with a straight ear canal extension. The hardness is 55 Shore 00. They comply with the IEC and ITU-T recommendations. The other accessories specific for this configuration are listed in the Ordering Info tab.